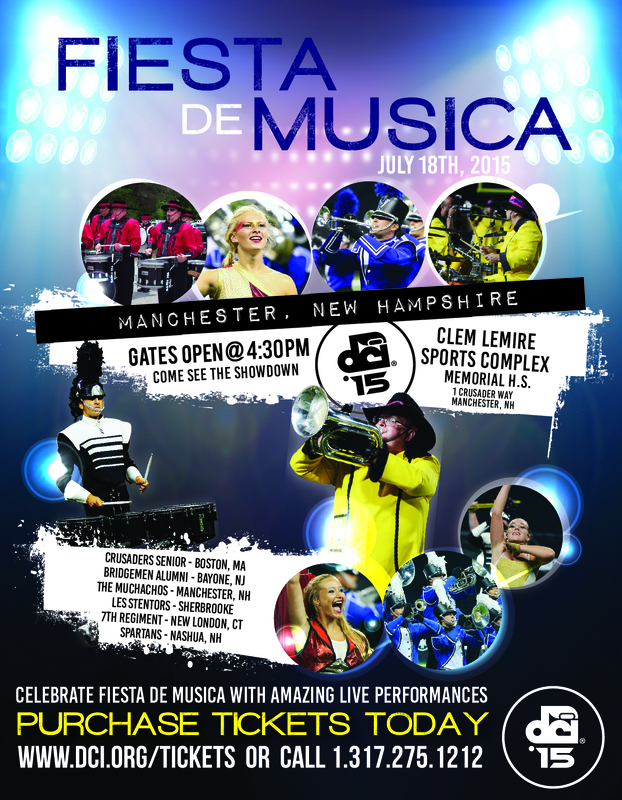 Congratulations to 7th Regiment Drum and Bugle Corps of New London, CT on their win at Fiesta de Musica 2015! After the Muchachos performed the National Anthems for Canada and the United States, and before the competition begin, the all-age corps performed in exhibition before a welcoming audience. First on was the Crusaders Senior Drum and Bugle Corps from Boston, MA, always a crowd favorite. 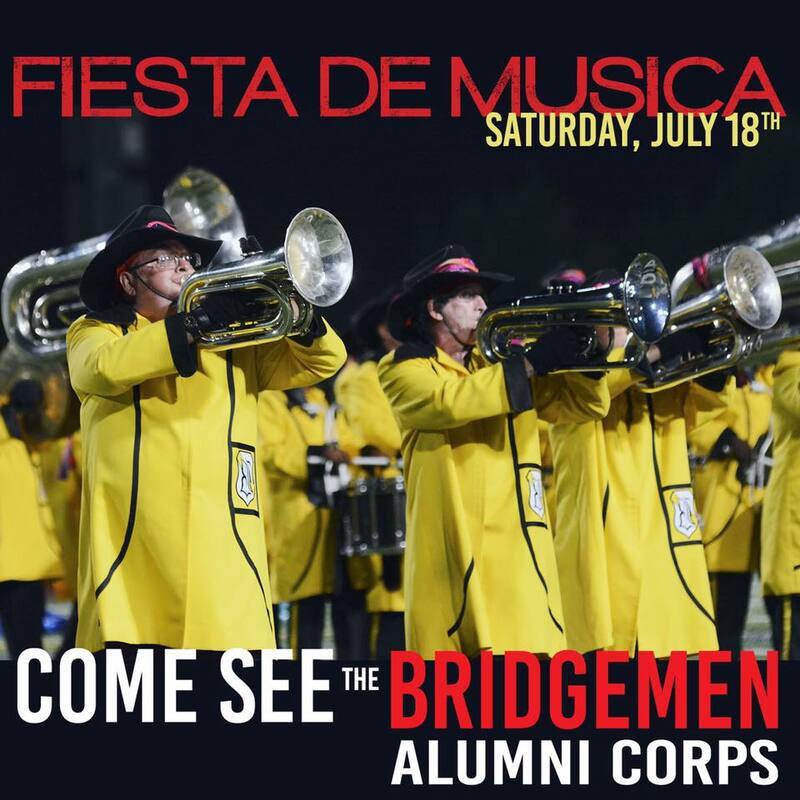 Next, a rare New Hampshire appearance by the always entertaining Bridgemen Alumni Drum and Bugle Corps from Bayonne, NJ. The Bridgemen also performed an encore at the of the evening. Wrapping up the exhibition portion of the show, Manchester's own Muchachos Drum and Bugle Corps performed their field show, "Music on a Summer Night". All Corps put on great performances under very warm and humid weather. In Drumline Battle, "old school" vs. "new school", Crusaders Senior was deemed winner over Bridgemen in the tightly-contested first battle of the evening. In the second battle, 7th Regiment triumphed over the Spartans in another great showdown. And in the final battle of the evening, the "new school" 7th Regiment prevailed over the "old school" Crusaders Senior. Thank you to all participating Corps, the Muchachos staff, volunteers, Inspire Arts & Music, and the Manchester audience, for making Fiesta de Musica a great success! "Old" vs. "New" will face off to determine drumline champ! New this year at Fiesta de Musica drum corps show will be drumline "battles" where drumline ensembles perform head-to-head in competition. There will be three drumline battles at the show. The first battle will be between the Bridgemen Alumni and Crusaders Sr. drumlines and the second will be between the Spartans and 7th Regiment drumlines. The winner of each battle will face off in the final battle of the evening, "Old vs. New". 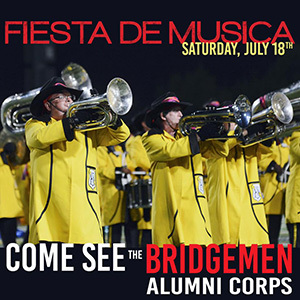 This is an exciting addition to our annual Fiesta de Musica drum corps show, and we hope you can join us! Gates open at 4:30 PM. Tickets are available online through Drum Corps International (DCI) or call 1-317-275-1212. 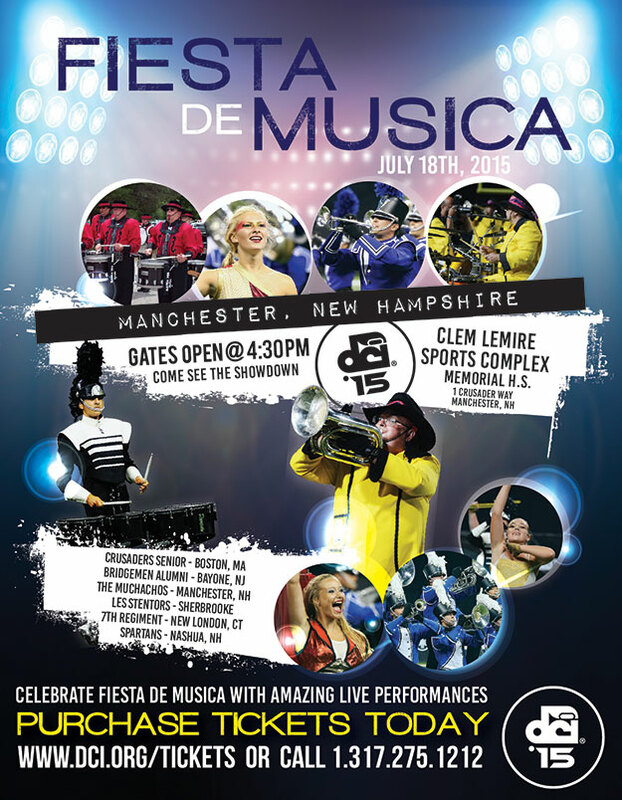 Come join us Saturday, July 18th, at Memorial High School's Clem Lemire Sports Complex, 1 Crusader Way in Manchester for our annual Fiesta de Musica drum corps show featuring corps from around the country, and Canada, as they perform during their summer tour. This event also features some of the best and most delicious food trucks from the New England area! Click on poster for high-res version. You can help support the Muchachos Drum and Bugle Corps simply by signing up for Goodshop and choosing our cause. Then, we can begin automatically receiving up to 20% of every purchase you make at one of Goodshop’s 5,000+ top online retailers. You can also save money with deals on things like business cards from Vistaprint, dresses from Macy's, and phone plans from Boost Mobile, so start shopping today!